We all know that books are, in fact, judged by their covers. Because of this, and because the marketplace is so crazy competitive, your cover can make or break your book. 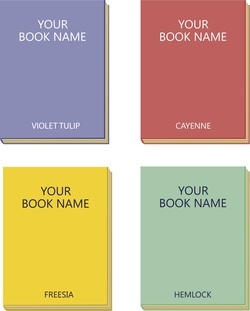 But there's a bit of a rub where cover design is concerned, which is that many authors fancy themselves book designers. But being the expert on your book does not necessarily make you the expert on your book's design. I've worked in book publishing -- and therefore with cover designers -- for more than fifteen years. Some of the best designers I've worked with are prickly and opinionated and uncompromising. In a lot of ways you want a designer like this, because it means they care about their work. These designers are like Gucci or Oscar de la Renta on Oscar night. Your book is wearing your designer's work, and presentation really matters. As an editor at a traditional house, I always bent over backward to try to help authors get the cover they wanted. There are only two times I can recall that I forced covers on authors, and they thanked me later. There are countless other times I folded, choosing to let the author have their way rather than put up a fight. And there are a few covers I regret not having fought harder to change. It's often difficult to articulate to authors why the cover they visualize in their minds or mock up using their rudimentary Photoshop skills isn't strong. Cover design hinges on good taste and being original. It's a work of art that evokes an emotional response in a viewer -- who happens to be a person who's considering whether the text behind that cover is worth their time. Chip Kidd, Knopf's famous and talented associate art director, offers an education about design in his TED talk, "Designing books is no laughing matter. OK, it is," in which he talks about book design as a first impression. A book cover's job is to create a feeling inside its potential reader, and while it can and should tell a story about your book, it should not tell the story of your whole book. It simply can't. It's a representation, an emotional hit, an impression, and a work of art. #1. It needs to look good thumbnail-size. Most designers are paying a lot of attention to this lately, but just in case they're not, shrink your cover down to the size it will be on Amazon and see how it looks. Does it pop? Can you read the title? Does it make you want to click? #2. Being overly literal won't do you any favors. Kidd addresses this topic in his talk when he tells a story about going to his first graphic design class. The teacher writes the word "apple" on the board, then flashes an image of an apple. He covers up the word and says, pointing to the image, "You can either show this." Then he shows the word and covers up the image and says, "Or write this." His message: Do not do both. And yet so many book covers do exactly that. The image in the cover is so "on the nose" that the reader is seeing your title manifested into an image. Avoid directing your designer to do this because you think your reader needs it. They don't. It underestimates their intelligence. #3. Avoid too much de- or re-construction in your feedback. I've witnessed many authors, upon being presented with four or five designs, feeling compelled to pick and choose from those various design options to create a composite based on all their favorite elements. This can work sometimes, if you're swapping a font, for instance. But largely this kind of high-level directing ends up diluting the power of the original design, and the vision of the designer. If you don't have an eye for composition, consider asking questions of your designer before offering your feedback or direction. Ask them why they made the choices they made, and consider their rationale before you deconstruct or reconstruct. #4. Driving your point home across too many fronts is the kiss of death. This is similar to being too on the nose, but it's writing the word "apple," showing an apple, and then also, for good measure, asking the designer to use big block type with bite marks taken out of each of the letters that spell APPLE. In essence, it's going too far. And yet many authors love to go too far where book covers are concerned. This stems, I think, from a desire to be clever, but be forewarned. Design elements whose sole purpose is to provide yet another reference to your title or theme is more often overkill than clever. #5. Personal attachment will limit your possibilities. The most common forms of personal attachment are family photos and artwork done by a friend or family member. Memoirists often want their cover to have a personal image, which is great when it works. But remain objective if you can, and ask your designer for their unbiased opinion. Same goes for artwork from family members. I've seen authors so invested in an opportunity to showcase the artwork of a loved one that they forget that the artwork has zero sentimental value to their readers. Include it in the mix maybe, but don't mandate that a particular piece of art be your only cover direction. At the end of the day, be grateful if you're working with a designer who has strong opinions, and remember that what matters most is not that it tell the story of your whole book, but that it evoke an emotion that's pure and on point with your message or story.